This sweet little lady measures 24" long. She can either be hung up or is just as cute sitting. 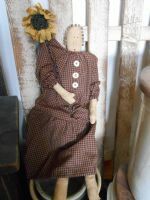 She is holding a giant sunflower that is made from homespun fabric with a rug hooked wool center. Her dress is Cranberry, Cream and Black check homespun with two vintage buttons down the center of her blouse. 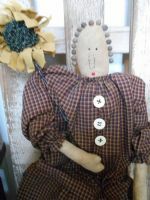 What a darling prim doll to leave out all year long! $32.50 FREE SHIPPING IN 48 U.S. Others email me for shipping charges.